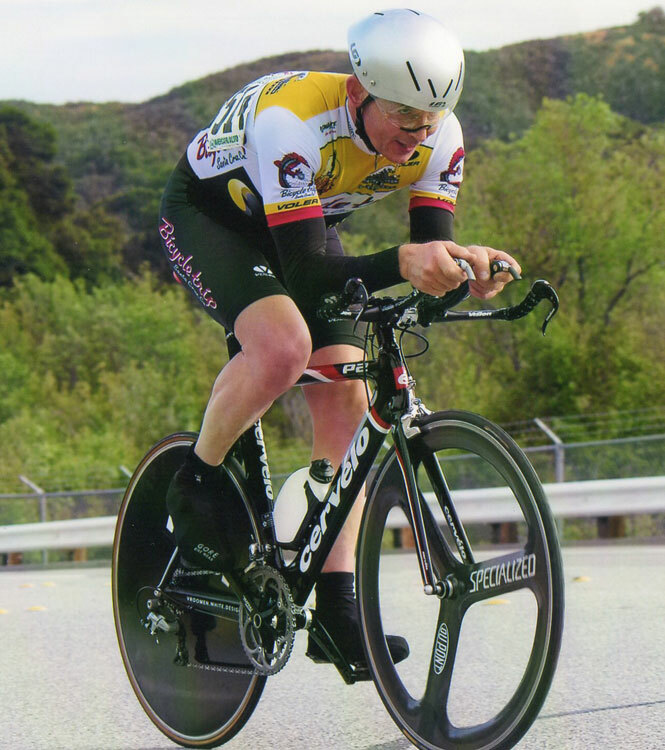 After racing only on my Cervélo road bike, I decided to get back into time trial racing. And being well aware of Cervélo’s winning record in races against the clock around the world, from professional road events to triathlons, it was an easy choice to go with one of their aero rigs. My local Cervélo dealer here in Santa Cruz is Spokesman Bicycles, so I pedaled down there to see which models they had in stock and was impressed that they had the P2, P3 and P4. I spent a lot of time comparing the models to decide which offered the most value for my budget. Finally I decided on the P2, which sells for around $2,500 (click on the photo for a larger view). Before I purchased it, I wanted to make sure I got the right size and that the frame geometry and components would allow a UCI legal riding position, since I plan to use the bike in the Masters Nationals where bikes are checked for compliance on a special jig. Equally important I wanted to make sure I wouldn’t lose any power in the aero riding position. Spokesman owner, expert fitter, and longtime friend Wade Hall checked me out on the bike. I brought my regular road bike in for him to copy the fit from and transfer it to the P2. He then had me lie on a table to check my body out, do some flexibility tests and asked me a lot of questions about my cycling abilities and sports injuries. Next I climbed on the P2 which was mounted in a trainer and started warming up while video cameras displayed my every move on a giant flatscreen TV in front of me. Wade kept fine-tuning my position, asking questions, watching my pedal stroke and upper body. After an hour of this, he had the bike in what he felt was the optimum position. 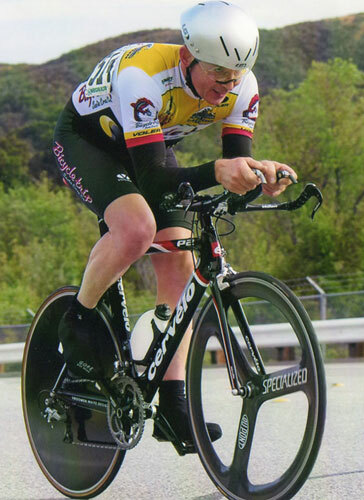 I have a lot of experience fitting bicyclists so it was fun watching Wade work and learning from him about my limitations and how we could dial in the bike to achieve aerodynamic efficiency and optimum power output. One of his most interesting recommendations was to switch out the stock 172.5 crankarms to shorter ones, maybe as short as 160s. This surprised me because I’ve been riding 175s on my road bike since I first got into road racing. But Wade ran the film of my fitting on the TV and pointed out the reason the shorter cranks would help me. I could clearly see that on every pedal stroke, one of my legs was coming up higher than the other one, essentially kicking me in the ribs, causing me to rock in the seat and flay my knee out to the side. It was plain that I wasn’t pedaling efficiently and that this was making me less aero, too. I’m flexible enough to ride comfortably in the low aero bar position for optimum aerodynamics. However, my leg issue caused problems. So, a clever solution was to try shorter crankarms. Since the fitting, I’ve compared notes with other racers at the time trials I’ve done and it seems that many have heard of this trick, and those with leg issues like mine have switched too. I initially went to 170s because Wade had some to swap with the 172.5s on the P2. Then I switched to 165s and felt a significant improvement immediately. Now, I have gone to 160s (the crankset in the photo is the 165). I bought the P2 because of its reputation as a fast bike. Even though it’s not Cervélo’s top-of-the-line TT bike, it has still won plenty of major events. I had an old HED disc wheel I bought when I was a triathlete in 1985 and a Specialized Tri-Spoke, so I’m using them as my race wheels. The other change I made was to replace the front sidepull brake with a 1981 Shimano Dura-Ace AX centerpull brake. That’s just to get the cable out of the wind and to add a funny aero touch that I like (Lance Armstrong had this brake on one of his TT bikes). I also drilled the base handlebar so that I could run my cables through them and clean up the front end. Ideally you don’t want the housings out in the wind but tucked in. I use a zip tie to hold them next to the top tube so they resemble those that actually enter the top tube on Cervélo’s more expensive models. I also added an Arundel Chrono aero bottle and cage since that’s said to make bikes more slippery too. Unfortunately my old HED disc is a 7-speed freewheel wheel, so I’m running friction bar-end shifters and can only get a 12-tooth smallest cog. In the photo you can see that I’ve got standard 39/53 chainrings. But, I’ve since swapped them for SRAM 55/44 aero rings to get a higher gear. You need it because this bike gets up to speed fast. At some point I will upgrade to a modern disc wheel so that I can run an 11-tooth cassette cog and modern shifters that return to the aero position after each shift, like Zipp’s. Or maybe Shimano Di2 electric shifting, which might be the fastest setup. Fumbling with my friction shifters and not having a higher gear costs me time on hilly courses. But, I’m still going fairly fast. How fast? So far I have taken almost 2.5 minutes off my best time at our local Santa Cruz County Cycling Club’s monthly Swanton Time Trial. My best time now is 29:38 and I hope with more training on the P2 I can go a little faster. But I’m really happy with how much free speed you get from such an affordable bike. Plus, the P2 has the same impressive power transfer of my Cervélo road bike, matches its stability on the downhills and also damps vibrations for a nice, smooth ride. If you’re in the market for a time trial or triathlon bicycle be sure to check out Cervélo’s.